PhariseeChurch: St Gregory ... Wonder-worker or Try-Harder? St Gregory the Wonderworker was born a pagan in the year 213 AD—exactly 1800 years ago. He travelled to Palestine, and in Caesarea he was converted to Christianity through the ministry of the famous theologian Origen who was residing there. After this he returned to his hometown of Caesarea—Neo-Caesarea it’s called to distinguish it from the other one—in Pontus, now northern Turkey, where he was made bishop. It’s said that when he became a bishop there were just 17 Christians in his diocese (things were a good bit smaller in those days). When he died there were just 17 pagans. The rest had been converted. A Wonderworker indeed. 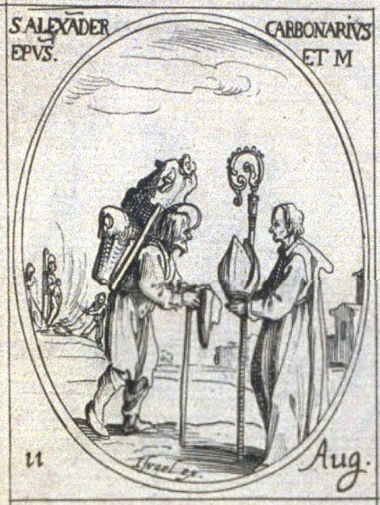 This Gregory is famous for many things, but perhaps the best-known is his role in the appointment of St Alexander the Charcoal-burner as Bishop of the nearby Diocese of Comana. The story goes that the church in Comana was looking for a new bishop and had called in Gregory to advise on the appointment. They drew up a short-list of candidates, all distinguished and highly regarded members of the community, and asked Gregory to interview them. Which he did—and rejected them all, one after another, as unsuitable. Dead end. Gregory took the mention of the name, even in jest, as being a potential divine Providence and asked to see the man. So Alexander was brought in—the filthiest, dirtiest man in the town, covered in charcoal dust from head to foot, as befitted his profession. Gregory saw through the dirt and the grime to the man of God underneath, and promptly consecrated him as the new Bishop of Comana. St Alexander the Charcoal-burner turned out to be an outstanding bishop. He held the post for many years, and finally died a martyr’s death, probably during the great empire-wide persecution that took place during the reign of the Roman emperor Decius. It seems that he was burnt to death, as was common at that time, thus ending up as … dare I say it … charcoal. An appropriately symbolic end for such a humble man. So is it time to paint over our sign and replace it with "Church of St Gregory the Wonderworker"? Sadly not. It's just the wrong Gregory. I wish I could convince myself otherwise, but I’ve had to conclude that the Wonderworker and the Try-harder were two separate individuals. You see, our Gregory’s mind doesn’t work that way. Our Gregory is a pragmatist. And a politician. He sees the basis of successful ministry as being to keep as many people as possible happy, for as long as possible. And that is very hard work indeed. Which is one reason why he tries as hard as he does, and to so little avail. What he has probably never fully understood in the course of his long and undistinguished ministry as that however hard you try, it’s never going to be quite enough. There’s always room to try harder so you never quite get there. In his own way he’s probably happy. In his own way he may feel fulfilled. Hard work can do that for you. Even when the results are meagre. Even that meagerness can be turned round to look like a virtue. What a pity he can’t look beneath the dust and the grime to see a few Alexanders hidden under it all. Then he might indeed be St Gregory the Wonderworker. As it is, he is and will remain, our very own St Gregory the Try-harder.